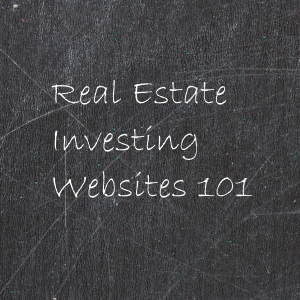 A growing number of Real Estate Investors create websites for their business. Investor websites are a great place to tell people about your company and refer buyers when you have a house under contract. But what do smart investors use their websites for? The lifeblood of every real estate wholesaler is marketing. Marketing gets your phone ringing and the more times your phone rings the better chance that you will get a deal. You need a way to consistently keep your phone ringing. Out-bound marketing tactics like direct mail, driving for dollars, door knocking and cold calling are effective. But they require YOU to seek out the motivated sellers. A lead that comes through your website is a form of an In-Bound lead. These leads SEEK YOU OUT. Just think about that…Your website is always out there, always attracting new leads…Out-Bound marketing strategies need to be redone over and over and over again. When is the best time to get a website? Right now. Don’t wait for when you have the time or next year. Get your website up and running today. The earlier you get your website up and running the better. I know how it is…you don’t want to get a website until you have the time, the money or you are stalling because you need to find an answer to a particular question first. Isn’t this the same excuse for why it took you so long to start investing in real estate? The simple fact is that you just need to get started and get something out there. One of the greatest strengths your website can have is it’s “AGE”…How long it has been live. All search engines take this into consideration when ranking your site. You can’t fake “AGE”. So even if your site is up and running for a year with minimal content it doesn’t matter. You can add more substance when ever you have the time or money. For investors without a website who just can’t afford to spend the time putting one together I highly recommend a company called Investor Carrot. They will give you a high quality site for only $29 per month. Take a look at my site…SellYourNJHouse.com. It is mostly how it was when they created it. The site ranks #1 for We Buy Houses NJ(at the time of I wrote this) and pulls in 10 plus leads per month and growing. I’ve had it less then a year! This post is a punch list for what you should have on a website for your real estate investing business. It’s all about converting traffic into leads. From what type of content to have and what to offer sellers who find your site. Creating a website for your real estate investing business is becoming more important with each passing year. Along with that is the need for multiple websites to handle different aspects of your investing. Once you have everything up and running it’s time to start focusing on converting your visitors into actual leads. There really is no point in getting traffic if they don’t fill out your contact form. I wrote a guest post on my friends Seth Williams’ Blog (retipser.com) about a 2-step contact form that converts up to 60% better then the standard…Fill these 5 fields in and submit…forms. If you’re not leveraging the internet to grow your real estate investing business, you’re really missing out! There is a lot you can do in the internet marketing space, but this article specifically discusses how to leverage social networking for real estate investing. Many social networking applications enjoy widespread use and best of all, they are free! Below are 10 quick tips on how you can use popular social networking tools. …So make sure you enter your email address and sign up for the Struggling Investor Newsletter. I agree. you really need a real estate website that will help you capture buyer leads and seller leads. Hi, I’m interested in possibly purchasing the investor carrot website but the lowest one is $50 per month, not $29. How can I get the $29 deal? As far as I know the 29$ price is a thing of the past. I got it when I signed up 2 years ago. The price went up about a year ago and has held there since then. It’s still worth $50/mo for sure though! You can just use your states standard real estate contract for your offers. Just make sure that it allows assignments. If not then you’ll need to add an addendum to it. For buyers I just use a simple contract that states what we are agreeing to do and it will include any deposit/escrow information as well. There are many places you can find those contracts. You can ask a Realtor for one or I’m sure you can find one using google. To be honest i would go and network with some active investors in your area and ask them if you could perhaps use their offer contracts. Some people might not like to share, but I’m sure there will be some who won’t mind. Going to networking meetings is also a great way to find cash buyers.